There is something incredibly isolating about parenting, especially during those early days when you’re learning to navigate life with a newborn and acclimatize to your new role as a mother. It’s ironic really: the existence of your tiny, helpless new baby means that you’re never ever truly alone, and yet the loneliness of learning how to parent can be overwhelming. Worse still is how no one really admits it. When a new mother is asked how she’s doing, the requisite answer people are comfortable with is how in love she is with her new baby, or how amazing it all is to have this tiny person who happens to belong to her. But how overwhelming it is, or how scared that new mother feels, or completely unsure she is of what she’s doing and whether she’s doing it right? Or even how desperate she is for some form of support? No one wants to hear that. An African proverb tells us it takes a village to raise a child, but in the UAE, with so many of us leading expat lifestyles that translate into life without our immediate village — without the mothers and grandmothers and sisters and aunts and cousins we might turn to for help — that necessary and much needed village is missing in action. That is why friends and Dubai residents Nina Aeckerle-Ekambi and Romina Arougueti decided to create an online parenting village of their own. In May last year, Arougueti and Aeckerle-Ekambi took on the role of content creators who gather the experiences of mothers from all walks of life, living in the UAE, and interviewing them for their YouTube channel Think Like Mama. By giving women a chance to tell their stories and share their experiences in an interview format online, mothers everywhere are able to access these videos and tap into a community of shared inspiration, advice and experiences. Aeckerle-Ekambi is a German mother of one who lives in Dubai and works in corporate event management, after a previous career in humanitarian aid development. “As newish moms in the summer of 2017, Romi and I felt that on the one hand, we knew so much, but at the same time, we often felt like we know nothing and don’t know where to turn to,” she says. Arougueti, who is from Argentina and is also a mother of one, works in the field of customer service and customer satisfaction. The two friends have children similar in age — Aeckerle-Ekambi’s son is almost 3 years old while Arougueti’s daughter is approaching three and a half. Neither had any previous experience in creating video content. “We sat and talked about it. We’re both busy moms, we both have jobs, but we both felt that we needed a community to support us as mothers and then provide support to others. That’s how Think Like Mama was born,” explains Aeckerle-Ekambi. The two friends have always believed that while every mother has it within herself to handle motherhood and figure things out, there is no need to struggle alone. Think Like Mama is attempting to tell the story of as many mothers as possible. Through their videos, the women interview a diverse selection of mothers, as well as fathers or experts who can weigh in on a relevant area of parenting. The videos cover everything from the challenges that arise in parenting twins, balancing work and motherhood, different ways to prepare older children for the arrival of a new sibling, what it’s like hunting for a nanny in Dubai and how to do it, and even how to raise a vegetarian child. But the “conversations on a couch” that take place in Aeckerle-Ekambi’s living room are not always about such defined parenting issues. One video tackles what it’s like catching up with other mothers during playdates where children demand every ounce of your attention, while another addresses what a stay-at-home-mother thinks of her decision to leave work before having her baby now that it’s been two years down the line. Social media, breastfeeding while working full-time, how to best interview a nanny have all been tackled. Other questions: is there a right time to send a child off to daycare? How are dads different to mothers when it comes to parenting? Is it the end of the world if your baby skips crawling and decides to go straight to standing instead? How do you pick a nursery for your baby? And what’s self-care like for a mother? “Every mom has a story to tell, even when she’s in the depth of parenting craziness. We want mothers to speak their truth, tell their story, help share their experience, because someone out there might relate,” says Aeckerle-Ekambi. And while the women often share their own personal experiences and parenting anecdotes, especially through their Instagram account, they felt sharing their own personal experiences as mothers was simply not enough. 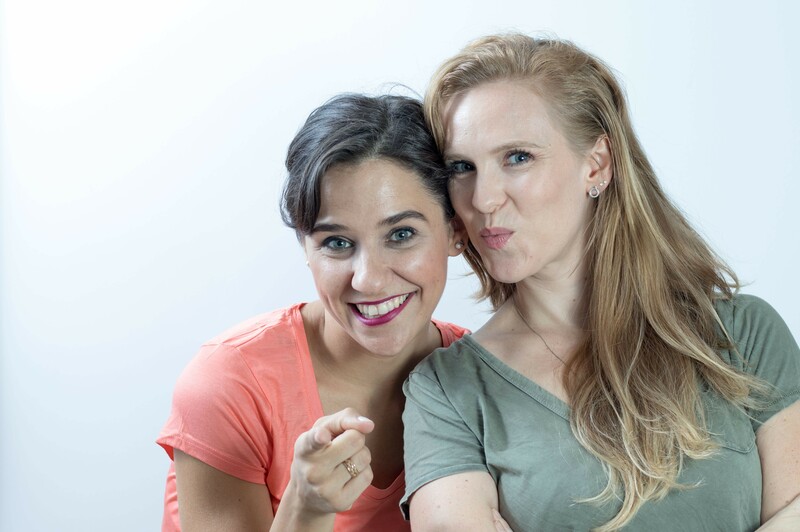 Nina Aeckerle-Ekambi (left) and Romina Arougueti’s Think Like Mama YouTube channel. Every two weeks, the pair releases a video interview that is between 17 and 30 minutes long, which they have edited themselves and filmed with the help of a videographer. They began by interviewing friends who are mothers and are now reaching out to anyone who has an experience to share that they believe can help other mothers. An interview with Alina, a single mother from Pakistan living in Dubai who was married off at a young age and then got a divorce, led to dozens of single mothers reaching out to share their experiences, and express how good it was to hear that they are not alone. Mothers who have started their own businesses from home, who have made the decision to stay at home, who battled post-natal depression, all offer different perspectives and experiences — without judgement. Each video wraps up with three takeaways. A vegan mother, for example, provides three tips on how to switch the household over to vegetarianism. At the playground one day, the women met a mother whose daughter was diagnosed with schizophrenia at age 10. A mother like that, explains Aeckerle-Ekambi, has plenty to share about what’s it like raising a child who is mentally unhealthy, how to be a mother to this child, how to address this child’s needs. “These are interesting and important stories that we don’t talk a lot about but there are many in positions who can benefit from them,” she says. Soon, the women plan to take Think Like Mama into the real world, and host events that will bring together the community they have built online. “We want to help mamas to develop further in body, mind and spirit so they can tackle the challenges of motherhood head on and fully enjoy the journey they are on,” says Arougueti. In the absence of a village, mothers struggle most. Think Like Mama has created that village and put it online for mothers to visit whenever they need a reminder that they are not alone. Find a new video every two weeks on @thinklikemama, accessible via YouTube, Facebook and Instagram.